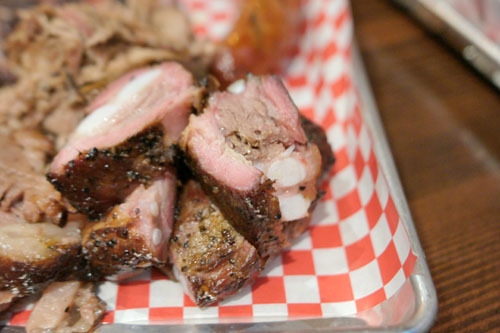 The biggest barbeque news to hit LA in the past several years is no doubt the launch of Bludso's Bar-&-Que. 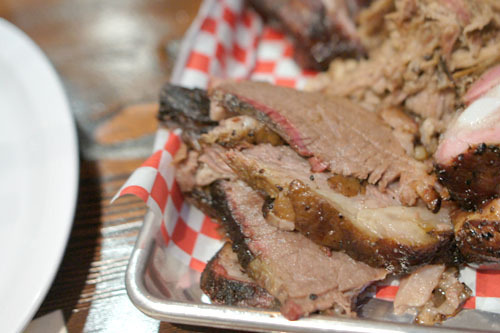 The restaurant debuted to eager Angelenos on February 18th, and represents a somewhat gentrified expansion of Kevin Bludso's eponymous BBQ joint in Compton, widely considered the best in the Southland. 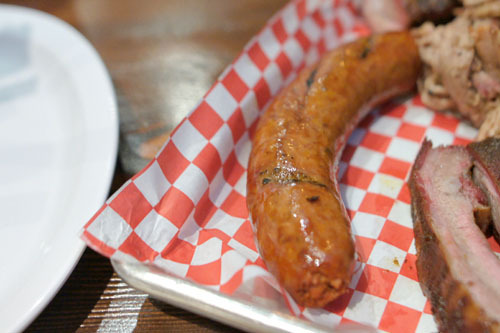 Bludso has partnered with Golden State's Jason Bernstein and Jason Starr here, and the trio has installed none other than former LA Weekly food writer Noah Galuten as pit master. About the Chef: Kevin Bludso hails from a family that's been barbequing Central Texas-style for four generations, though his parents moved out to California during their teenage years, eventually settling in Compton. His father exposed him to the merits of good barbeque early on, and at age nine, his mother started sending him to his grandmother's back in Texas, all in an effort to keep him out of trouble. Grandma Willie-Mae Fields ran a roadside BBQ shack in Corsicana, and taught the young Bludso all she knew of the craft, passed down to her from her own father. He hated the work, and swore up and down that he'd never get into the food service business, but little by little, he began mastering the art of the smoky, long-cooked meat. However, after graduating college, Bludso followed in his father's footsteps, and secured a position at Los Angeles' Department of Corrections. Bludso worked as a corrections officer for 11 years before leaving in his early thirties, sick of the job. Following, he focused on his catering business, which he'd done on the side for years, and then began hosting dinners at the Salvation Army in Compton. Slowly and surely, Bludso built a loyal following, which ultimately resulted in the opening of a permanent location in April 2008. 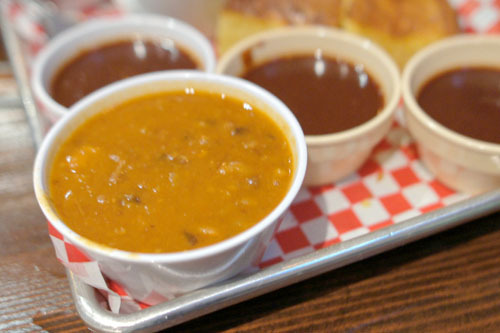 The humble BBQ shop was discovered in due time and brought to the forefront of the LA dining scene via social media--bloggers, Chowhounders, and yes, even Yelpers. Soon enough, the spot had made its rounds among the foodie cognoscenti, and Bludso was serving a demographic that he'd never even imagined before (hell, he even catered for Yeezy a while back). As such, I don't think we were too surprised when plans for the Bar-&-Que were announced last June. The restaurant resides in the structure once occupied by Mark Peel's The Tar Pit. The space has been thoroughly redone, the former tenant's clubby environs replaced by a harder, sparer, much more casual aesthetic, draped in shades of grey. The menu at Bludso's Bar-&-Que can be thought of as a condensed version of the original, featuring the most popular Ole Hickory-smoked meats as well as all the sides and even dessert (made by Nancy Lyons, Galuten's mother), though the weekend-only Angus beef ribs are nowhere to be found here. We ended up running the gamut, sampling everything on the menu. Meanwhile, to drink, you'll find a smattering of beer and wine (corkage is $15) along with a surprisingly formidable cocktail list created by Bernstein and GM Zak Fishman. Click for larger versions. 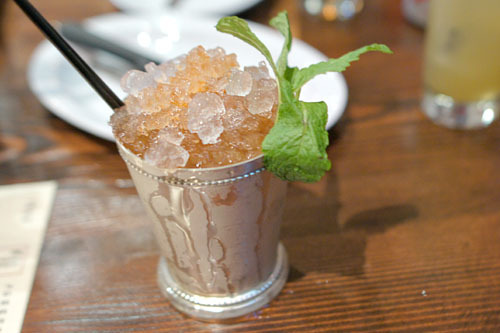 Speaking of cocktails, we of course had to start with their Julep on Tap, the most popular drink on the menu and a great version of the classic, with a bright mintiness to it that worked beautifully against the whiskey as well as the smoky meat. The Jackpot, meanwhile, was also enjoyable, with a bracing ginger spiciness that also served as a fitting counterpoint to the BBQ. Our first side was the baked beans. I appreciated the incorporation of meat into the dish, adding a blast of salty weight to the beans, but the sweetness here was a bit much for me. Behind the beans you'll notice two types of homemade sauce: mild (white bowl) and hot (brownish bowl). The mild is tomato-based, with molasses, and thus had a sweet, spicy character to it along with a fairly viscous consistency. The hot, which I preferred, was a touch thinner, with a vinegar-y heat that could creep up on you. Pork ribs were one of the highlights of the night. The meat wasn't quite falling-off-the-bone, but I certainly didn't have to expend much effort either, easily extracting the tender, flavorful meat and reveling in its spicy-smoky crust. 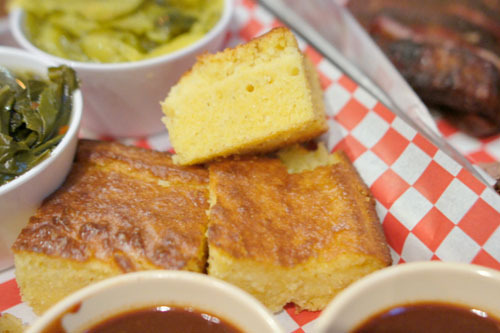 Cornbread was on point: sweet, gritty, and moist, a natural accompaniment to the BBQ. Sausages are made in-house I believe, and were surprisingly delicious, with a juicy, fine-grained consistency and a subtle undercurrent of heat. They'd work great in a hot dog I'd imagine. 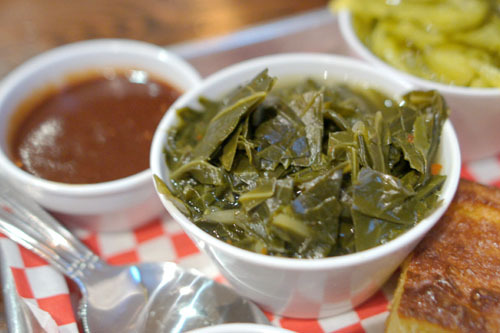 Collard greens were just about perfect, quite possibly the best I've had in fact. Cooked to a wonderfully supple consistency, they showed off a lovely bitterness to them along with some salty, savory notes as well. Pulled pork displayed mounds of smoky, mouthwatering, porcine goodness that I thoroughly enjoyed, especially when taken with a dab of hot sauce. However, the meat came out a touch dry, and could've stood to be juicier, more succulent. 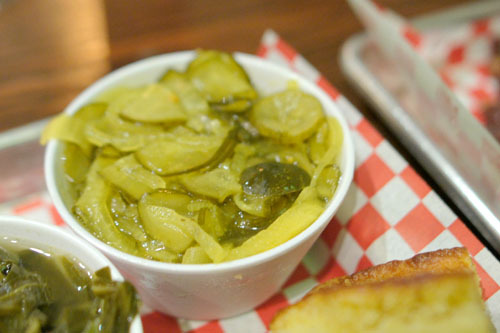 Pickles were bright and crisp, with a marked sweetness to them, just like you'd expect. Rib tips were perhaps the "meatiest" tasting item of the night, with a nice smoky component and a straightforward savoriness to them. My only concern was that parts of the meat were on the chewy side at times. And now we come to the brisket. It's what many regard as Bludso's signature dish, and with good reason. It was certainly my favorite item of the evening, showing off a beautiful balance of beefy and smoky flavors, with just enough spice to let the meat really sing. Lovely tenderness and juiciness here, too, making this a must-try. 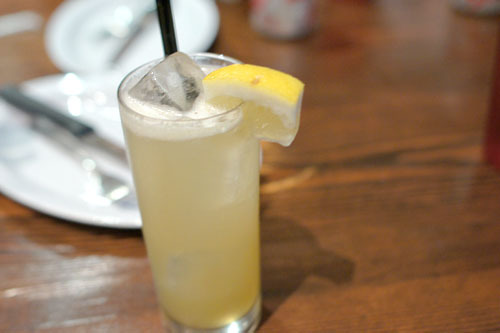 The Jalisco Honey could almost be thought of as a Negroni with mezcal. 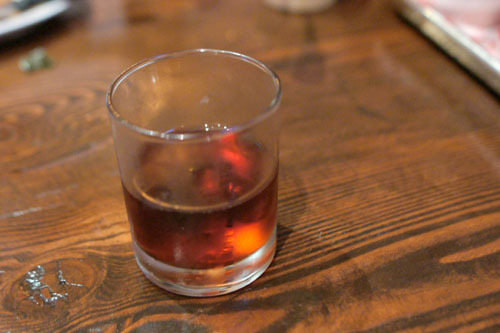 I rather liked it, finding a great interplay between the gin and bittersweet flavors of the Campari and vermouth, all while the mezcal added a focused smokiness to the mix that mimicked the flavors of the meat. 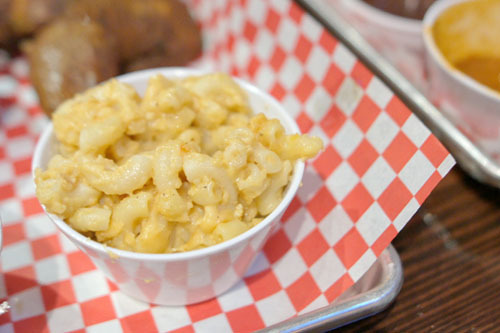 The macaroni and cheese was a prototypical presentation of the dish, with a particularly high cheese content it seemed, though the noodles themselves could've been firmer. Chicken was a surprise hit of the night. 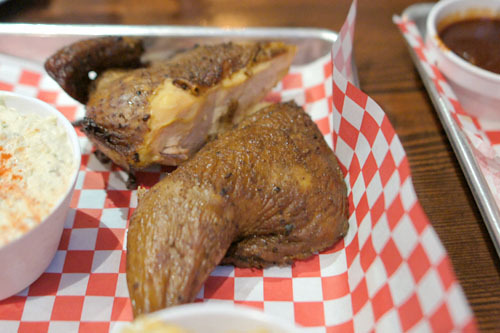 I went for the drumstick, and found it moist and supple, with a marked smokiness to it that complemented, but didn't overwhelm the natural flavors of the bird. The breast wasn't quite as luxurious naturally, but was nevertheless enjoyable as well. Give this a shot. 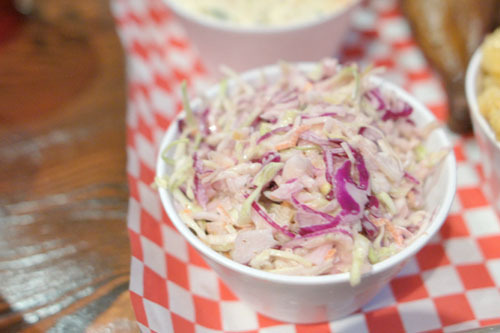 Also a winner was the coleslaw, which turned out to be one of the strongest preparations I've had. I adored the crunch of the veggies here, and how their bright, bracing, acidic flavors tempered the potency of the meat. 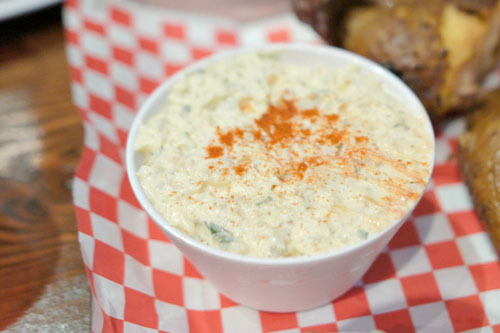 Last up was the potato salad. I'm a big fan of it in general, and the version here didn't disappoint, offering up a classic interpretation of the dish that worked gorgeously alongside the BBQ. 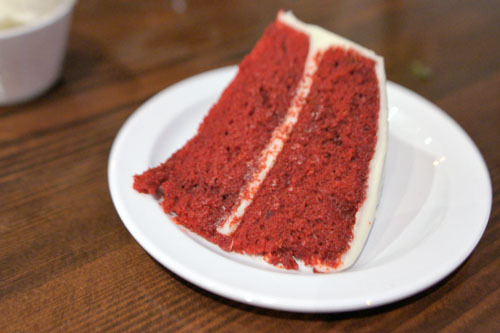 It might have something to do with the color, but I'm always drawn to red velvet, and the version tonight was surely one of the best I've had. I loved the moistness of the cake, and how its sweet, but not overly sweet taste paired with the tangy icing. 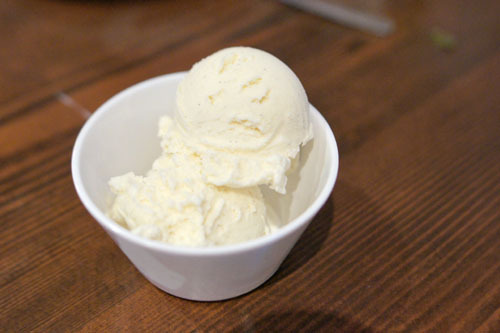 Scoops-supplied ice cream (also found at Golden State) was of the salty vanilla variety, and was excellent, conveying all that's great about vanilla, but with a creeping hit of savoriness on the back end. 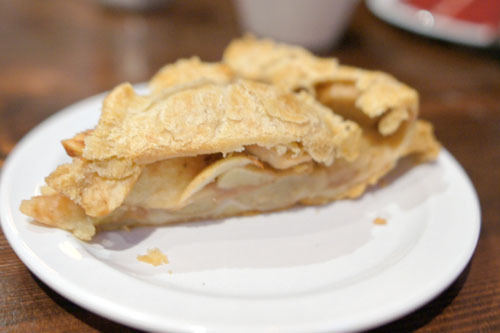 A by-the-book apple pie rounded out the desserts: nice crust, crisp apples, and great with the aforementioned ice cream, but it could've stood to be served warmer. For various logistical reasons, I'd never made it out to the Bludso's in Compton, so I don't exactly have a basis for comparison here against the original. That being said, I can understand the appeal of the place. I'm not a huge barbeque guy, but this is my style: smoky and slow-cooked, with multifaceted seasonings and a focus on the meat itself and not the sauce. It sorta wants to make me explore the genre further. So Bludso's BBQ is finally out of the 'hood and in LA proper, replete with a smart cocktail program, surprisingly decent service, and a hipsterish vibe--I bet Kevin never saw this coming. Would've never expected a post of this from you. Wow, nothing stokes the appetite like clinical phrases such as "easily extracting the tender, flavorful meat." You should worry less about your vocabulary and more about conveying how appetizing the food was (or was not)! Though it is nice to be able to order alcoholic beverages, have a place to sit and enjoy your meal and be in an area that is not so nitty gritty... I the food at the original location is much better. not having the fear of being shot is actually a detraction for me. ;). 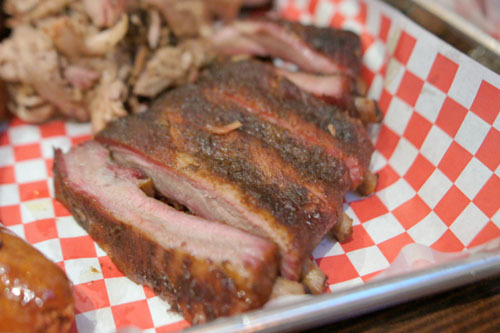 Properly smoked pork ribs, whether baby backs or St. Louis should never fall off the bone. 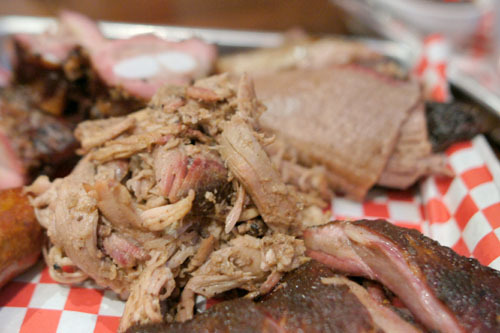 The meat should be a little bit smokey, tender, and have just a bit of bite left to chew off the bone, not fall off the bone. I so enjoy your blog Kevin, so thanks for everything you do. Your photos are exceptional. Chris: How come? I mean, I've posted about Original Tommy's before so it's not like it's too low brow lol. Anon: I really don't think there's anything with the word "extracting." I've seen it used plenty of times when it comes to this sort of thing. Anon: I'm glad someone got the wry humour there. Vinh: That's what I've heard, unfortunately. Charlie: Hmm, you're the first I've heard who didn't think that it was the best BBQ, evar. So which place is better than "just ok?" Dianne: Thanks for that clarification. I do agree that the meat shouldn't *literally* fall off the bone, so I was using the term a bit loosely there.